We all know that world of technology is developing at a pace that has never been seen before. Every time we look around, there is a new app, a new cyber threat or a new piece of technology that is revolutionizing the way we live, work and play. As a Network Engineer, this is all very exciting to me. As a Federal Expert Witness in Digital Forensics, it also scares the…well you know what out of me. For every leap in technology that allows us to accomplish more, there is also the chance that that leap is opening up serious liabilities. On the really nefarious side of it, you’ve got cyber-terrorism, online human trafficking and a host of other illegal activities that are difficult to monitor and even more difficult to investigate and prosecute. However, for this post, we’re going to focus on the less scary but still very serious side effect of technology: distraction. The Breathalyzer, a device which infers your blood alcohol level based on your breath, has been a roadside law enforcement tool for decades. We’ve had cell phones for about as long and they weren’t deemed a problem, remaining all but undetectable if the user wore a headset. Making or accepting a voice call was a brief, practiced action with a cell phone and the driver could still keep his eyes on the road. However, text messaging completely changed this dynamic. Text messaging requires a driver’s visual attention and typically means they are looking down, losing even peripheral vision of traffic. 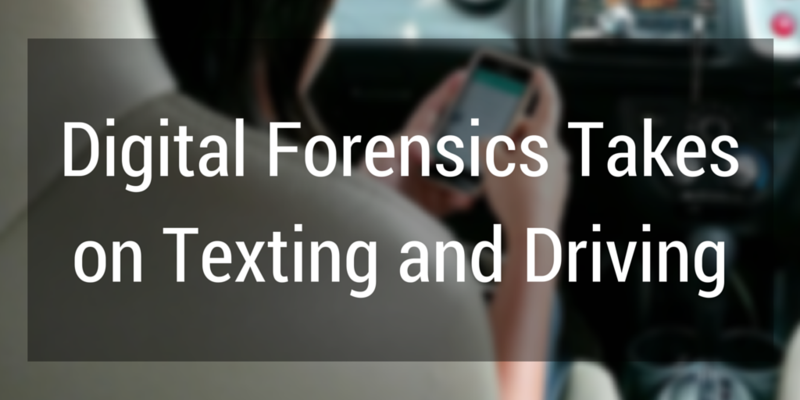 Accident investigators began finding injured or dead drivers with phones showing active SMS text communication immediately prior to the crash. This problem has steadily escalated as smart phones with full keyboards sped up texting and 3G cell service brought social networks and email into the hands of those drivers. Current investigative process of an accident involving cell phones is like a field sobriety test before the advent of the Breathalyzer. A police officer asks to see your phone and if there is discernible activity, you can be arrested. There are several problems with this. For example, many phones require a passcode or fingerprint to access and so consent becomes an issue. The maze of social networking applications is another minefield. And we haven’t even gotten into the massive number of photos, videos and other bits of information that can be stored on a phone. It is not reasonable to expect a patrolman to handle what may be a digital crime scene. That is why a number of applications are being developed for this very purpose. For example, Israel’s Cellebrite offers a system that captures a full copy of any phone that is handled. While this is progressive technology, it creates a 4th Amendment issue because once the phone is accessed, all of its content is available. The question then becomes how far can the police go once they are inside the phone? They only need the data from sixty seconds prior to the crash, but the mobile system will probably over-collect, perhaps just grabbing everything and leaving it to a forensic analyst to sort out what is relevant. Here are just a few problems I can think of with that approach. The analyst will see all of your text messages. If your spouse were sleeping prior to the crash and there were provocative messages being exchanged with someone else, that could provide tremendous leverage to a prosecutor attempting to force a plea deal. The analyst will also see all of your direct messages for Facebook or Twitter. What if you’ve been planning a party with friends that involves recreational drug use? Even if you’re squeaky clean, there is something in your phone that you don’t want the world knowing. While the 4th Amendment issues are something for the courts to figure out (and something they will probably be fighting about for years to come), where we come in is as a resource to attorneys who could benefit from analysis of their client’s cell phones. Many attorneys know that there is information there that could be useful, but they simply don’t know how to collect it, analyze it and be able to present it coherently to a judge. That’s where we come in. We can capture and do forensic analysis on that phone and tell the attorney exactly where their client was at the time of the accident (both geographically and on the web), whether or not he was texting directly prior to the accident (or ordering a pizza or sending Auntie Sue a happy birthday message on Facebook) and make a reasonable assumption about the connection between their cell phone usage and their liability in the accident. Think how powerful it could be if you had proof that your client had not touched his phone for the five minutes prior to the accident. All of the sudden, a case of ‘he said she said’ becomes a case with ironclad evidence. As is the case with any new specialties that emerge, one of the biggest challenges is making sure those who need that specialty are aware it exists. 12 Points is eager to be a resource to attorneys who may be involved in a technology-related case and we welcome any opportunities to further explain what we do. Shawn Kasal is the Principal Forensics Analyst at 12 Points and serves as certified Expert Witness for clients as needed. With over 15 years of experience in network engineering and digital forensics, Shawn consults with our clients on issues ranging from criminal defense to corporate litigation. He is trained to gather digital evidence to assist clients in eDiscovery, Computer Forensics, Cyber Incident Response, Threat Attribution, and Data Recovery. He has worked for several ISP’s and was responsible for shutting down Bot-Nets, DDoS attacks (distributed denial-of-service) and other infrastructure hazards. Shawn is listed as a CJA expert witness for the Federal Public Defenders office. Shawn’s professional qualifications include certifications and training from Cisco, Microsoft, Apple/Mac, Novell/Suse, Dell, HP, Oracle/Solaris, VMware, Red Hat and IBM. In addition, he has digital forensics training and forensic software experience with SANS, DOD, Blackbagtech, Katana Forensics, Cellebrite, MOBLedit, AccessData Group for Forensic Toolkit (FTK) (MPE+), Guidance Software for Encase, Paraben and several other forensic toolkits and product suites.